8 Electrical Installation in your log cabin. 10 The Quirks of Log Cabins when installing Electrical Systems. 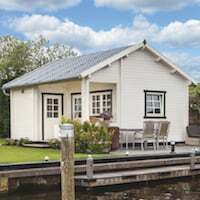 When we buy a Log Cabin there are a lot of considerations, not only what it looks like but the size, style, the quality of the log cabin and price. We also have to consider whether it is permitted development or whether it needs planning permission. 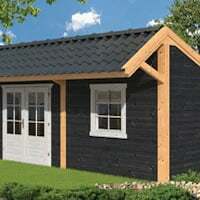 If we want to have electrics in our log cabins we also have to consider Building Regulations. As well as being a reasonable fitter I do have experience of electrics in log cabins as I’m also a qualified electrician. 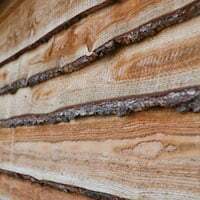 If you are intending to install an electrics in your log cabin and are aware of building regs then please skip most of this but please do read at least the last section in this post which talks about the quirks of installing electrics in log cabins and things you should inform your electrician about. There are three types of people who can install electrics in your log cabin. An Electrician who is registered with a ‘scheme provider’. An Electrician who is not registered. Any of these people can install the electrical system in your log cabin. In January of 2005 the Part P of the building regulations came into effect. Part P is the last part of Schedule One to the Building Regulations. It concerns Electrical Safety. The approved document identifies a legal requirement for all work on fixed electrical installations in dwellings and associated buildings to comply with the relevant standards. The relevant standards are known as the 17th Edition IEE Wiring Regulations:BS7671 and any amendments current. It also places a legal obligation that any electrical work outside is notified to the Local Building Control. Your log cabin electrical system MUST be notified. A certificate is vitally important for any electrical works carried out since 2005. When you come to sell your home you will be asked for a certificate for any work carried out after this date, without it you may well have a problem to overcome before the sale. Also, should you have a fire, this is one of the first things asked for by your insurance company, without a valid certificate your claim may be void. This is an example of a certificate that should be issued with your Log Cabin electrical installation. You will notice it has one page for the main house consumer unit and another for the log cabin consumer unit. If an electrician is a member of this scheme it means that he is able to self certify his or her own work. It also means that they are assessed yearly, their work is monitored, qualifications are up to date and that their test equipment is properly calibrated. Also, very importantly, that they are fully insured and their work is guaranteed. They are assessed yearly that they can correctly test and issue an Electrical Installation Certificate. They can then register the installation with your local building control and as they can self certify they are exempt from informing Local Building Control before an install and only do so following the installation and testing. By employing a registered electrician you are ensuring that the installation fully complies with all the regulations as best you can. I recommend you always use an electrician who is registered with a Scheme provider as it takes away all the responsibilities from you. I would also recommend that if they state that they are registered that you check their credentials here: http://www.competentperson.co.uk/ or with their registered body. If you want to use an unregistered electrician or indeed if you want to carry out the electrical installation in your log cabin you’re perfectly allowed to. However, you MUST inform your Local Building Control BEFORE you do anything. 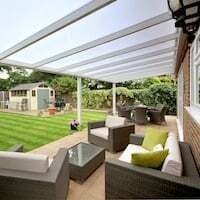 They will generally ask for a description of the installation, diagrams and details of the level of experience and knowledge of the installer. They will want to visit and check on the stages of work before and during the various stages. When the work is completed and BEFORE it is energised they will visit your log cabin. They will inspect the installation which will include ensuring it meets the wiring regulations and they will test and certificate it for you. There may be a charge for this service. Electricity is not something to muck about with as we all know, it’s dangerous stuff. There are fines of up to £5000 for non compliance with Part P of the Building Regulations. If you do not have sufficient knowledge to Design, Install and Test an installation to the current wiring standards do not even consider attempting it as it could be a very costly mistake. Electrical Installation in your log cabin. With the law and regulation bits out of the way and who to use lets now look at the installation itself. Before you can do anything you need to plan out exactly what you want to power in there. 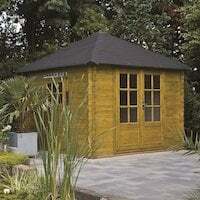 Our log cabins are very often used as a garden office so lets look at that scenario as an example. You obviously need lights in your cabin, maybe a couple inside and one outside light on a PIR. You’re going to be running a couple of computers, perhaps a music player, a printer, charger, you’ll probably want a cup of tea so make allowance for a kettle. 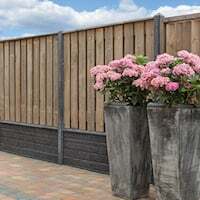 You may also like an outdoor socket for your electric mower or a spot of DIY. Keep a note of all these items, and also any that you might be likely to use in the future. This will give your electrician an idea of the amount of power you will be requiring and they will then design the system to account for that maximum power useage, if they’re anything like me they will also allow for future proofing and design their system higher than your basic requirement. When you ask an electrician to quote for your work you can expect him to use one of two ways to install the electrical system in your log cabin. Which method is used will depend greatly on your power requirement. The first method is to take a power directly from your main consumer unit. This is the preferred method. If you do not have any spare ways he will introduce a smaller consumer unit from the main supply to supply your log cabin. In any case this supply will be RCD protected. It is unlikely this method is used for anything other than a single light and a single socket and only if the log cabin is very close to your house. 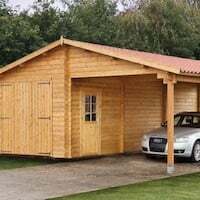 In both cases an electrician will use armoured cable to supply the log cabin. This cable can either be fixed in clear site of immovable objects such as walls and possibly fences or buried in the ground. As a rule of thumb it will be buried to a depth of one and a half spade depths which is about 500mm. 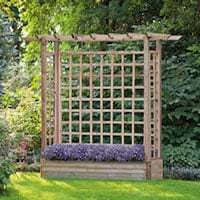 It should be buried deeper across flower beds or vegetable gardens. You can often save money by creating a trench for the cable yourself before your electrician arrives. When your electrician designs your electrical system he is going to base it on your power requirements, the distance away from the main incoming supply and the condition and rating of your supply. There are of course other factors but this is all he needs to know from you as the customer to be able to quote for you. Number of lights and sockets in your log cabin. Power requirement: You can either add up the watts or amps of each electrical item or tell the electrician what you intend to use and he will make the calculations. Distance from the main supply or consumer unit. Condition of your consumer unit and whether there are any spare ways within it. Route of the supply cable to your log cabin and whether you will be digging the trench yourself. Exit route from your consumer unit in the house to the outside. The Quirks of Log Cabins when installing Electrical Systems. If your electrician is not experienced with installing a system in a Log Cabin you need to make him / her aware that it is a bit quirky and that they’ve got some extra considerations to make when installing it. If they’re not experienced or you don’t tell them I guarantee you’ll be calling them back! All electricians, or at least the good ones want to do the best job they can. We’re also sticklers for neatness, we like our wires to be straight, no twists, our terminals to be tight and well trimmed and above all we love everything to look lovely and professional. To give the perfect finish within your log cabin we will want to use trunking. It’s this trunking that causes the problems. So, before they carry out the work tell them that the log cabin MOVES! 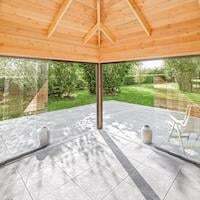 It can move a lot as well, some of the big 58mm log cabins and thicker can move up to 70mm over the course of a year, this is an inherent property of timber and entirely normal, it will expand and contract according to humidity, weather and other factors. This movement is what will cause you to call your electrician back as all his lovely neat trunking will fall off the walls, or at worst create splits and cracks in your logs where the trunking is screwed without an expansion gap and will in effect hold two logs together and prevent them expanding naturally. This will create splits in the logs! Create an oval in the trunking and do not screw it fully tight allowing the logs to move underneath it. NEVER fix logs together, this is very important when mounting the consumer unit as it is often more than one log high. If expansion is not allowed for the logs will SPLIT. Consider using round conduit pipe outside the building entirely. The saddles that attach it will allow expansion and it will look alot nicer inside. This is my preferred method and I tend to hide it around the foundation beam and ‘T’ up from it, the corner crosses of a log cabin are also very good for hiding conduit. If you are insulating the roof of your log cabin consider lighting circuit cables on top of the roof. If you require further information on the best way to install electrics into log cabins please let me know and I’ll help where I can. 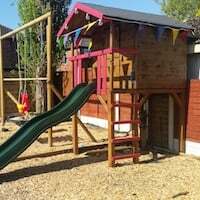 This entry was posted in Log Cabin Fitting Tips, Technical - Log Cabins and Timber and tagged cabin, electricity, electrics, fitting, log, log cabin, log cabins by Richard. Bookmark the permalink. 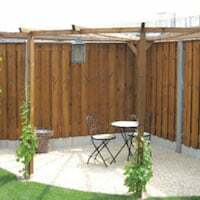 A Log Cabin in your garden will require an Electrical Installation Certificate to comply. You can install yourself but you will need to inform building control you are doing this and they will then test the system for you. It is unlikely an electrician will agree to sign off your work as when he issues a certificate it is for the whole installation that he has installed. very informative, time and time again I attended properties that have had their electrician carry out work requiring Part P certification and have been left with nothing. Brilliant advice to have read prior to delivery of my cabin tomorrow. Useful info to bear in mind over the next few weeks while I tackle the electrics. Just wanted to check your thoughts on bringing the input cable into the cabin. Typically, I’d run the armoured cable carrying power from the house up the wall of the external building (cabin, shed, etc.) into a waterproof enclosure mounted on the outside, and take regular twin and earth cable from this enclosure through the wall into the building. The armoured cable would be secured firmly to the external building wall using p clips. If I’ve understood you correctly, this approach could potentially cause problems with a cabin, as when the logs expand/contract the armoured cable and enclosure could be either pulled apart or pushed together, neither of which is ideal. So is a workable solution to take the armoured cable through a hole in the bottom log, and connect to a suitable junction box inside the cabin (and run cable from this junction box in conduit as you’ve described)? If so, do you have a view on what sealant to use to stop draughts around the cable? (I’m assuming regular flexible sealants may not cope with range of expansion / contraction in the logs that you’ve described). 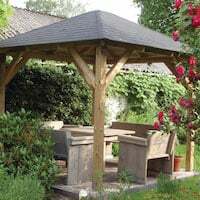 There’s several different ways you can run a supply into a log cabin but all need to consider that the logs will expand and contract as we have discussed. When I was doing installs I would take the armoured cable through an adaptable box directly to the rear of the consumer unit at the first or second log or just below depending on how the logs met and type of consumer unit. One log will have minimal movement so it is easy to adapt for contraction / expansion. If you are taking a cable up a whole wall you will need to allow a lot more room for slack / taught. If I’m using an external adaptable box (IP65) on the outside I do not have need to seal the cable through hole. If I did find a situation where a seal needed to be made it would be a silicon based product. I have seen this done a couple of times and it does work so long as you allow room for expansion in the cable. The one problem I found was the size of the hole and the number of cables that might travel through it, plus also the insulative properties of timber is a consideration to the cable size. I have also seen customer flush fit the sockets but of course great care needs to be taken with the depth. I found this ever so useful and it really helped me when discussing my requirements with an Electrician. Many thanks in deed….and yes it is very easy, no nonsense text for us non-electricians. Where would you suggest the power enters the log cabin, from under the floor? If so, how would the cable get through the damp proof membrane? I personally like to take the armoured cable through a lower log via an adaptable box and then up into the consumer unit. You can of course come in through the base and then the floor but it takes quite a bit of accuracy. You could seal around the DPM and cable with silicone. Just about to install power to my cabin and this blog has given me some great tips, thank you. Thanks for this – it’s been a great help! But what do you mean by “create an oval in the trunking”? You would create a slot in the trunking, then when it is fixed the screw is not tightened 100% this then allows the logs to still move unhindered. What an informative, no nonsense blog. Thanks for inspiring confidence!